The national debt of Bulgaria is another way of saying “Bulgaria’s general government debt,” which means the debts of every layer of government. Certain government debts, such as those incurred by state-owned enterprises, are not included in the national debt figures. International financial bodies, such as the IMF, only include formal debt arrangements that are covered by borrowing agreements. This means that bank loans and borrowing through the issuance bonds are included. However, debts represented by unpaid invoices are not counted. Obligations to external bodies, such as guarantees to the European Financial Stability Fund are included. However, domestic obligations represented by guarantees on loans to given to state-owned enterprises and obligations to future pension payments, are not included. Bulgaria is a member of the EU, but not a member of the Eurozone. The country has its own currency, which is called the Lev. As the country is an EU member, the Bulgarian government is obliged to report its finances according to rules laid down in the Maastricht Treaty and these figures are monitored by Eurostat. The rules for the calculation of national debt used by the IMF and Eurostat are very similar. One difference is that Eurostat counts obligations to EU institutions as part of the national debt, whereas the IMF does not. Economists are more interested in a country’s ability to repay debt rather than the absolute amount. So, they use a debt to GDP ratio when they express national debt. The IMF calculated Bulgaria’s debt to GDP ratio as 24% at the end of 2017. The Eurostat 2017 figure came out at 25.4%. The IMF also reports net debt figures. The headline debt to GDP figures refer to “gross debt.” Net debt is calculated by deducting all of the financial assets held by the government of a country from its gross debt. At the end of 2017, Bulgaria’s net debt to GDP ratio was 10.9%. This means that Bulgaria’s assets could pay off more than half of the country’s national debt. Bulgaria had a tumultuous period after changing over from the communist system in the early 1990s and adopting the capitalist model. Eurostat only started collecting economic data on Bulgaria in 1997. However, the graph below shows that the debt accumulated by the country in the 1990s was rapidly paid down during the first decade of this century. 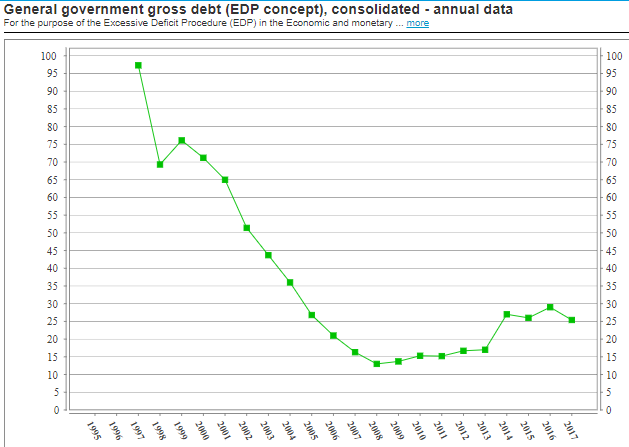 Bulgaria’s debt to GDP ratio reduced from 97.3% in 1997 to 13% in 2008. Bulgaria wasn’t hit as hard by the 2008 global financial crisis as the larger economies in the world. Nonetheless, the general global economic slowdown did impact on the Bulgarian economy. The country’s rapid rate of growth was hit hard by the global downturn. The graph below from Eurostat shows that the country’s economy experienced a sharp retraction throughout 2009. 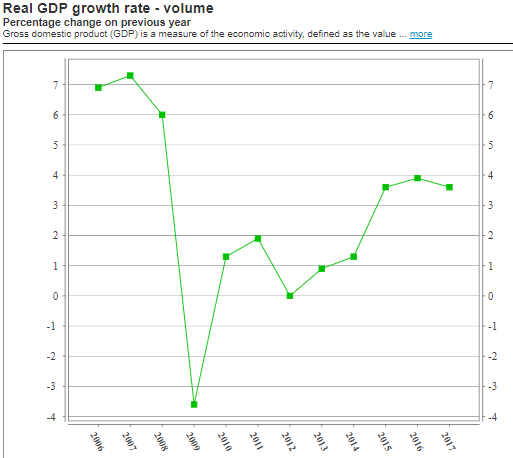 However, Bulgaria has managed to keep its GDP changes in positive territory since that year. The Bulgarian government implemented a reflationary policy in 2014, which can be seen as an increase in debt in the first graph in this section. However, that policy paid off with a leap in economic growth during 2015, which can be seen in the second graph. Although the government is still running budget deficits to expand its economy, the rate of GDP growth is now exceeding the rate of government borrowing, so in 2017, the national debt of Bulgaria as a percentage of GDP started to fall. What is Bulgaria’s credit rating? The credit rating of a government takes into account a range of economic and political factors. The three main credit ratings agencies give Bulgaria a surprisingly low rating, as shown in the table below. What facts should you know about Bulgaria's national debt? You could wrap $1 bills around the Earth 68 times with the debt amount. If you lay $1 bills on top of each other they would make a pile 1,900 km, or 1,181 miles high.